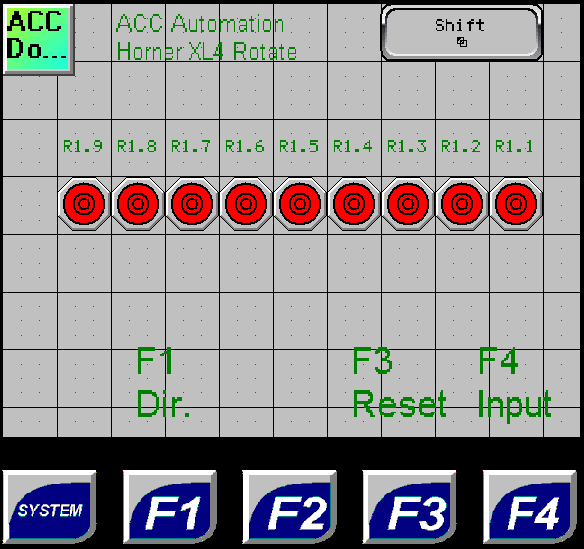 The Horner APG XL4 all in one controller has several different instructions to shift and rotate the bits, bytes, words or double words in the memory. We will be discussing the bitwise operations of the shift and rotate instructions. Looking further into the move operations we will look at the Element Rotate and Element Shift instructions as they pertain to a conveyor belt tracking application. A review of the shift register can be seen at the following link. 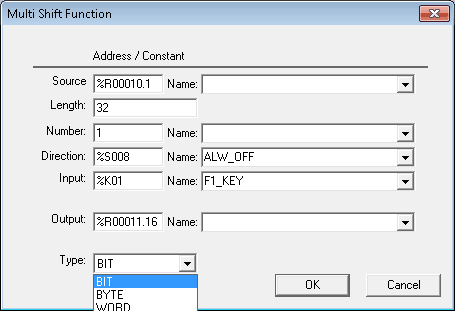 Shift and Rotate elements in the bitwise operation work on either a 16 or 32 bit unsigned values. Shifting involves moving the bits in the registers either left or right by a certain number. The trigger to make this happen is by the power flow to the instruction itself. In most cases we will have to create a positive or negative transition coil in the logic as an input to the instruction. Information that is shifted past the last bit in either direction is lost. Rotating is also moving the bits in the registers either left or right by a certain number. Information is not lost because the end bits rotate around to the other end as they are moved. This can happen in either direction. The trigger to make this happen is by the power flow to the instruction itself. In most cases we will have to create a positive or negative transition coil in the logic as an input to the instruction. Under the move operations we also have the element rotate and element shift instructions. Let’s now review these two instructions in depth and operate both. This instruction will allow an array of memory to be rotated left or right a variable number of times. Power Flow – This will trigger the instruction to rotate. Note: This will happen every scan of the PLC so you must use transition coils. See example below. Source – This is the starting memory of the rotate. 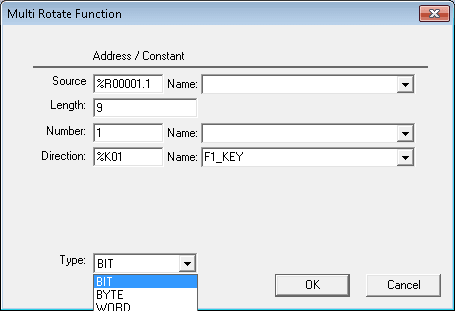 If you are using bits it must specify a bit location. If it is a word then a word location must be specified. Etc. Length – This is the length of the memory. It is based upon the Type specified. In our example the length is 9 bits long. Number – This is the number of rotations to do when the instruction has power flow. In our case this will be shifted by one. Direction – This is the direction of the rotation. Right or Left is determined by the status of a bit in memory. We will be using our F1 key as the direction input. Type – This is the type of rotate that we will be executing. This means that we can rotate by bit, byte, word or double word. 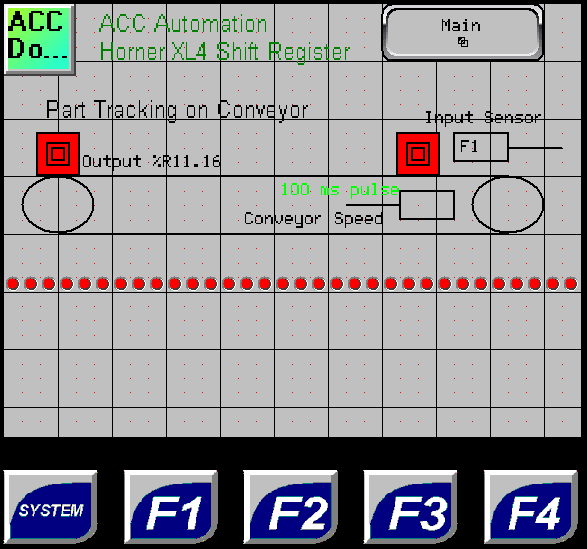 Here is our PLC ladder logic diagram example. This is our Horner APG HMI screen for the rotate instruction. This instruction will allow an array of memory to be shifted left or right a variable number of times. Power Flow – This will trigger the instruction to shift. Note: This will happen every scan of the PLC so you must use transition coils. See example below. Source – This is the starting memory of the shift. If you are using bits it must specify a bit location. If it is a word then a word location must be specified. Etc. Length – This is the length of the memory. It is based upon the Type specified. In our example the length is 32 bits long. Number – This is the number of rotations to do when the instruction has power flow. In our case this will be shifted by one bit. Direction – This is the direction of the rotation. Right or Left is determined by the status of a bit in memory. 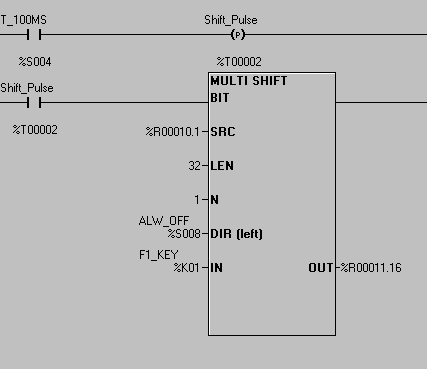 Input – This specifies where the input will come from and be placed in our shift register. In our case this will be the F1 key on the display. The bit status will be shifted into the source location when the instruction is executed (power flow). 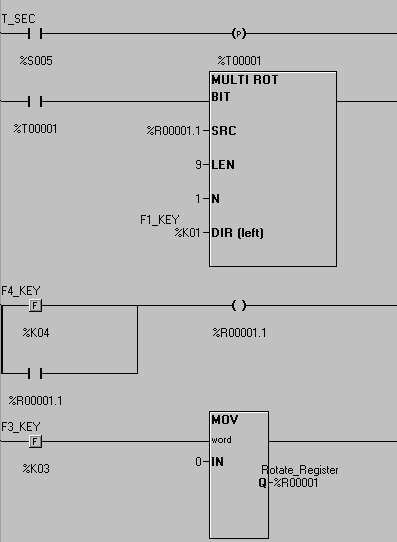 Output – This is the last bit of memory that is shifted out of the array. This is our Horner APG HMI screen for the shift instruction. What we are doing is modeling a conveyor belt that is running. (100ms pulse bits) When product is sensed on the conveyor belt, F1 key, bits are turned on. These bits represent the product along the conveyor belt. They will turn on an output when they reach a location on the conveyor. Note: This logic is used for product tracking, reject tracking, etc. Next time we will look at the recipe instruction.